WASHINGTON (AP) — President Donald Trump will reckon with the aftermath of a deadly mass shooting in Las Vegas as he meets Wednesday with survivors and law enforcement officials in a time of grief. Speaking to reporters on Tuesday, Trump said he'd be in Las Vegas to "pay our personal respects and condolences to everybody. What happened is such a tragedy. So unnecessary. Who can believe what happened to Las Vegas?" He later added that it was "a very horrible thing even to think about." Trump's trip to Las Vegas follows his Tuesday travel to hurricane-ravaged Puerto Rico. 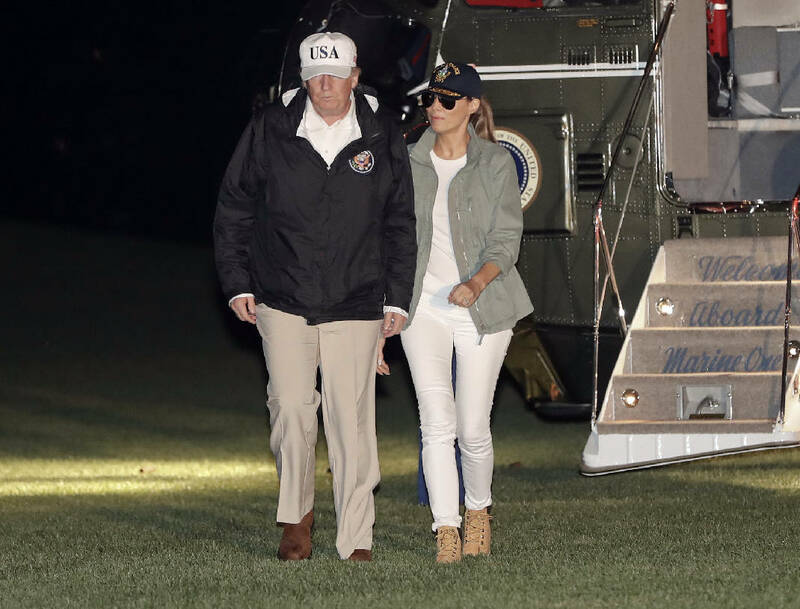 During that trip, he highlighted Puerto Rico's relatively low death toll compared with "a real catastrophe like Katrina," when as many as 1,800 people died in 2005 as levees protecting New Orleans broke. He also focused on the best of the reviews he and his administration are getting rather than criticism of the federal response to Hurricane Maria. As he departed the White House for Puerto Rico, Trump called the Las Vegas gunman "demented" and a "very, very sick individual." Trump also praised Las Vegas police, saying they had done an "incredible job." Asked about gun laws, the president said "we'll be talking about gun laws as time goes by." Trump offered somber remarks about the shooting from the White House on Monday, saying "our unity cannot be shattered by evil, our bonds cannot be broken by violence."